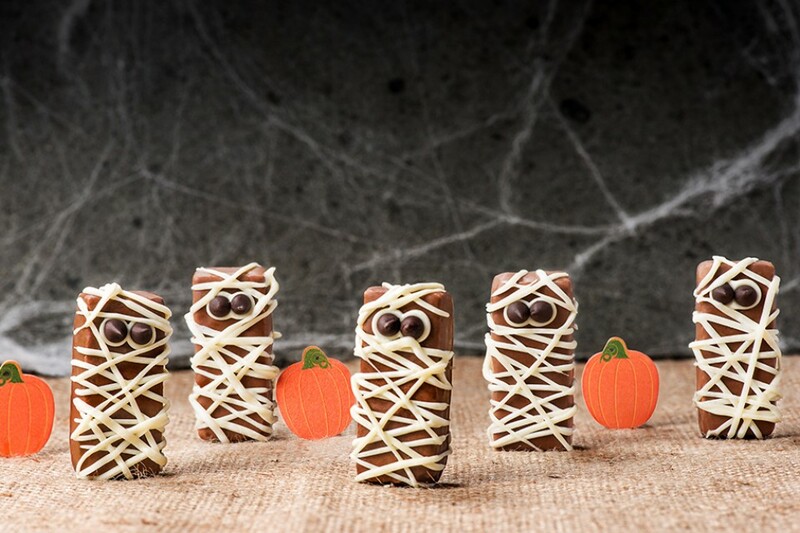 These bite-sized COFFIN CRISP Mummies will quickly spookify any Halloween celebration! Place COFFIN CRISP Snack Size Bars on a baking tray lined with parchment paper, leaving 2-inch (5 cm) space between each. Cool melted white chocolate slightly. Spoon into a medium resealable bag; snip corner. Pipe 2 dots on each COFFIN CRISP Snack Size Bar for the mummy’s eye. Adhere a mini dark chocolate chip to each to complete the eyes. Drizzle remaining white chocolate over COFFIN CRISP snack size bars to resemble a “wrapped” mummy look. Try using orange molding wafers in place of white chocolate chips, or change the colour using food colouring!